Benzimidazoles are a chemical class of compounds with broad anthelmintic activity that are vastly used in livestock, horses and pets to control all kinds of parasitic worms (helminths). Some veterinary benzimidazoles are also used as anthelmintics in human medicines. Other benzimidazoles are also used in agriculture to control parasitic helminths of plants, or as fungicides. In fact, benzimidazoles were already used as plant fungicides before their development as veterinary anthelmintics. The first veterinary benzimidazoles introduced in the 1960's (e.g. thiabendazole, parbendazole, oxibendazole) were highly effective against adults and larvae of most gastrointestinal roundworms (nematodes) of livestock. In the 1970's newer benzimidazoles such as albendazole, fenbendazole, mebendazole and oxfendazole were introduced that are also effective against non-gastrointestinal roundworms (in the lungs, kidneys, skin, etc., depending on compound and dose) as well as against tapeworms (cestodes). Albendazole is also effective against adult liver flukes (Fasciola hepatica). Triclabendazole is a special case: it is not effective against roundworms or tapeworms, but controls all larval and adult stages of various parasitic liver flukes (trematodes). Closely related with the benzimidazoles are the so-called pro-benzimidazoles febantel, netobimin and thiophanate. These compounds are pro-drugs because once in the organism of the host they are transformed into the active benzimidazole, mainly in the liver. Febantel is transformed into fenbendazole, and netobimin into albendazole. Pro-benzimidazoles have the advantage of being more soluble in water. This makes it easier to formulate them and they are also better absorbed in the host's body. Benzimidazoles and pro-benzimidazoles are veteran anthelmintics, i.e. they have lost patent protection long ago and are available as generics manufactured by numerous chemical companies (typically in China, India, Israel, Brazil, etc.). Several benzimidazoles such as cambendazole and parbendazole have been vastly replaced by newer, more effective and safer active ingredients. Beside the activity against adult and larval stages of roundworms and flukes, an important feature for all anthelmintics is whether they control so-called arrested or dormant larvae as well. These are larvae that after infecting a host do not continue development to adults immediately but remain in the tissues for several months, to "wake up" later on and resume development when the conditions for their development are more favorable. Efficacy against arrested larvae and against each specific parasite depends strongly on the dose used, and different commercial brands may be dosed differently. Therefore, read the label instructions to be sure whether a particular product covers the spectrum of activity you need. Unless delivered using a slow-release device, benzimidazoles have no residual effect. This means that a single administration will kill the parasites in the host, but will not protect against re-infestations. Benzimidazoles do not control external parasites such as flies, ticks, mites, etc. They neither control larvae (maggots) of parasitic flies that cause myiases. All benzimidazoles are poorly soluble in water. For this reason, most liquid formulations for cattle, sheep and goats are liquid suspensions for oral administration (drenches) or intraruminal injection. There are also numerous feed additives with benzimidazoles, especially for pig and poultry, but also for ruminants. A few benzimidazoles are also available as injectables (e.g. ricobendazole) or as slow-release boluses. For dogs and cats benzimidazoles are mostly available as tablets, pills, etc. or suspensions for oral administration. For horses, most benzimidazoles are available as oral pastes. Mixtures of benzimidazoles with active ingredients of other chemical classes are quite frequent. On livestock they are used either to broaden the spectrum of activity (e.g. + closantel to control flukes), or to overcome resistance (e.g. + endectocides and/or levamisole). On pets they may be combined with a broad-spectrum taenicide such as praziquantel. The molecular mode of action of all benzimidazoles consists in binding to tubulin, a structural protein of microtubules. These microtubules are important organelles involved in the motility, the division and the secretion processes of cells in all living organisms. In the worms the blocking of microtubules perturbs the uptake of glucose, which eventually empties the glycogen reserves. This blocks the whole energy management mechanism of the worms that are paralyzed and die or are expelled. Since cell division is also disturbed worm egg production and development is also blocked by benzimidazoles, i.e. they also have an ovicidal effect. The first benzimidazoles (e.g. thiabendazole, parbendazole) are hardly absorbed into blood in the gastrointestinal tract, mainly due to their poor solubility in water. This limits their efficacy against worms that are not in the digestive system but somewhere else in the host's body, e.g. in the lungs, kidneys, eyes, etc. Other benzimidazoles (e.g. albendazole, fenbendazole) are more soluble in water, better absorbed into blood and can reach worms in tissues and organs outside de digestive tube. Efficacy of all benzimidazoles in ruminants (i.e. cattle, sheep and goats) is strongly influenced by the time they remain in the rumen. The longer they remain, the more they are absorbed into blood and the higher their anthelmintic efficacy. For this reason it is very important that the administered dose ends up in the rumen (first stomach) and does not go directly into the abomasum (forth or final stomach). To ensure this when using drenches it is very important that the drench gun is positioned over the tongue and not in the anterior part of the mouth. Otherwise the "oesophageal groove reflex" could be activated, the animal would swallow the anthelmintic directly into the abomasum, and absorption to blood would be insufficient. An alternative to drenching that overcomes this problem is intraruminal injection, a quite popular delivery form of benzimidazoles to cattle in some countries. In animals with a simple stomach such as pigs, poultry, dogs and cats benzimidazoles go quite fast through the stomach and the time available for absorption is shorter. Consequently a higher dose or repeated treatments are needed to achieve effective control. As a general rule, benzimidazoles have no residual effect, or a rather short one, i.e. they kill the worms present in the host at the time of treatment, but provide no protection against re-infestation. After oral administration they are either excreted directly with the feces, or if absorbed into blood they are quickly metabolized (mostly in the liver) and the metabolites are excreted as well. Slow-release devices (e.g. boluses) as used in cattle and sheep are designed to overcome this lack of residual effect. They ensure availability of active ingredient in the digestive system of the host for weeks or even months. For ruminants, medicated mineral blocks can theoretically ensure "continuous treatment" to achieve a longer protection, but the unpredictable behavior of individual animals can easily lead to an insufficient intake of the anthelmintic or to overdosing. In pig and poultry the longer protection is usually achieved through in-feed medication for a predetermined period of time. This can also be done on cattle, sheep and goat, but only under conditions of intensive farming. Benzimidazoles have a much higher affinity for tubulin in the worm cells than for the tubulin in the cells of livestock or pets. This makes it possible that at the therapeutic dose the drug kills the nematodoes without harming the host. As a general rule, livestock, horses and pets tolerate benzimidazoles very well. The safety index ranges from 3 to 20, mostly >10. Benzimidazoles do not bind to host tissues and are rapidly excreted. This allows withholding periods for meat between 1 and 4 weeks, depending on the compound, the formulation and the administered dose. Use on dairy livestock is often not allowed in many countries, but this also depends on the specific product and its usage. Albendazole, (as well as netobimin and ricobendazole), cambendazole and parbendazole can be teratogenic, i.e. they can cause malformations in the embryos, and it is recommended not to use them in pregnant livestock, horses or pets. Use of benzimidazoles on livestock, horses or pets bears no significant safety risks for farm workers, pet owners or children playing with the pets. Resistance of gastrointestinal roundworms to benzimidazoles is a worldwide problem. It is especially dramatic in sheep and goats. Recent surveys have shown that gastrointestinal roundworm resistance to benzimidazoles affects more than 50% of the properties in some countries (e.g. Argentina, Mexico, New Zealand, Paraguay, etc.). The problem is less dramatic but not less worrying for cattle. It is also a serious problem in horses. The resistance problem is really serious because resistance to the usual alternatives to benzimidazoles (mainly macrocyclic lactones and levamisole) is also very frequent and increasing. In various countries there are even field strains of worms that are simultaneously resistant to all these chemical compounds, i.e. they have become multi-resistant. Several roundworm species of livestock have been reported to have developed resistance, e.g. 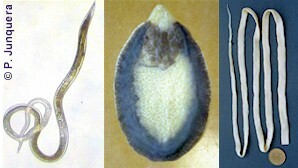 from the genus Chabertia, Cooperia, Haemonchus, Nematodirus, Oesophagostomum, Ostertagia - Teladorsagia, and Trichostrongylus. Among horse roundworms, serious resistance problems have been reported for Cyathostomins and for Parascaris equorum. As a rule, resistance to one benzimidazole means resistance to all benzimidazoles because they all have the same mechanism of action, i.e. they show cross-resistance. There are a few reports on lungworm (Dictyocaulus spp) resistance to benzimidazoles in cattle, but it seems to remain a local problem. Resistance of liver flukes (Fasciola hepatica) to benzimidazoles (triclabendazole and albendazole) in sheep started in the mid 1990's and it is now quite common in many European countries, Australia and New Zealand. It has been reported in Latin America as well. There are also a few reports on liver fluke resistance in cattle (e.g. Argentina, Netherlands) but so far the problem seems less extended than in sheep. So far there are no reports on significant problems with worm resistance to benzimidazoles in pig, poultry, dogs and cats.